I had a few questions about how I quilted my Indie star the other day, so I thought I’d do a walkthrough of how I did it. When I got it to the place I wanted, I wrapped tape round the stem on either side of the foot to prevent anything shifting, and it worked a treat! Next I went on the diagonal, stitching in the ditch between the enormous HSTs in the centre, and then having drawn a line with a Frixion pen out to the corner before I started, carried on sewing along this line. 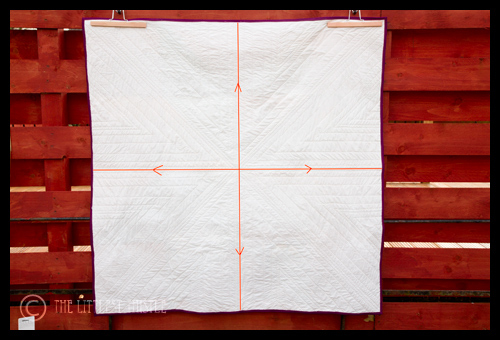 Now that the quilt was divided up into 8 sections, for my first set of lines I went for 1/2″ from the previous lines, knowing that from my needle to the edge of my walking foot was 1/2″, so I didn’t need the guide for that. For each section of the quilt I did from this point I went round each section in turn sewing the same line, so first all the ones where my needle would be to the left, and secondly all the ones where my needle would be to the right. For all of the sections I also always worked from the centre out. 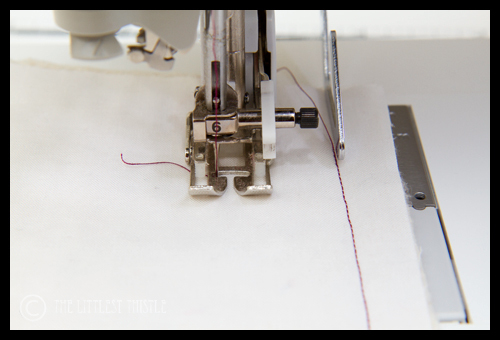 Basically you run the guide along your previous lines of stitching as you go to allow for a consistent distance between the lines without having to draw anything on the quilt. 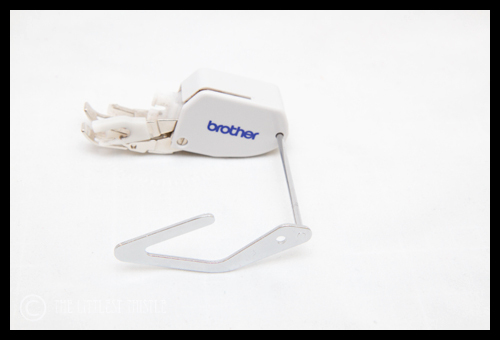 Now I’m not sure if all walking feet have such useful guides, but if you have a Brother, you can definitely get one! 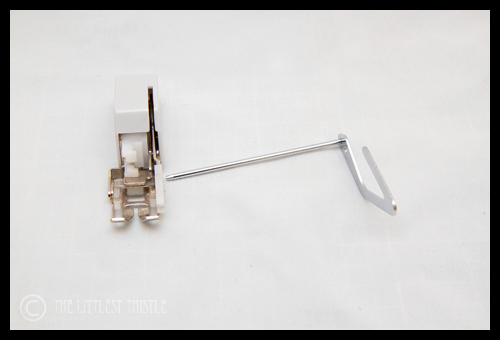 A similar guide came with the generic walking foot I bought for my sewing machine. Have had the same problems as you with it moving around will have to get out the tape next time too! You need to see the picture but I used a rawl plug and some empty bobbins!! Phew!! I started a couple of hours ago, and when I just saw your post I thought, "bugger, bet I'm doing it wrong…" I'm not. But, masking tape to hold the marker bit in place is GENIUS, its been driving me nuts. Cheers sweetie!! 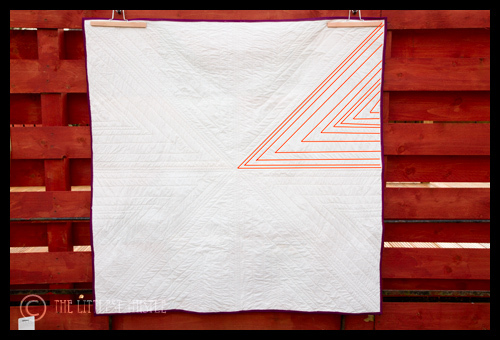 The quilting is gorgeous – I want someone to explain how to turn corners without the stitches slipping as that is the problem I had when echo-quilting the squares and rectangles on my hubby's quilt. What a wonderful explanation. Thanks. Great explanation. I'd never noticed my walking foot guide shifting but then it's a stiff so and so to manipulate into submission in the first place. And I've never done a really big quilt so maybe less chance of it shifting with smaller quilts? 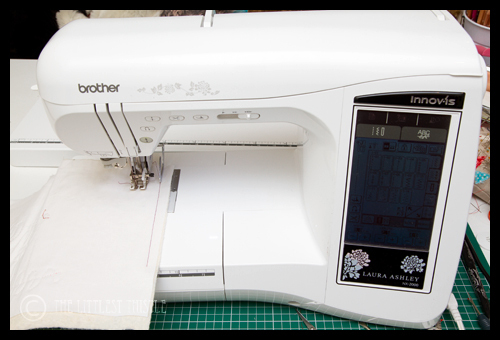 Thanks for sharing, my 'old' Janome has one of those guides too it was pretty useful. I need to 'quilt' tonight but not sure where to start. 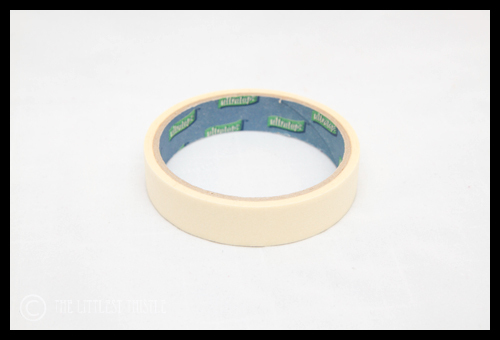 There is no masking tape in the house, someone has used it all up (much like the sellotape). Excellent heads up on your technique…it looks fabulous . I love your quilting design. Thanks for sharing your technique. I have a guide, too and use it a lot. Thank you so much for this post Katy! I need to go and find one of those guides ASAP. I have one on my Janome which works a treat. I usually check every other line to make sure it hasn't moved and so far so good. I just used it to quilt my triangles quilt. It's great to read your starry quilting ways. A guard came with my sewing machine, so simple but very handy. Oops , not a guard, a guide, silly me. I've never used my walking foot so I don't know if I'd need masking tape. Great tutorial! It's looks great. Thanks for telling us how you did it. This bit of insight was just super. Thank you!